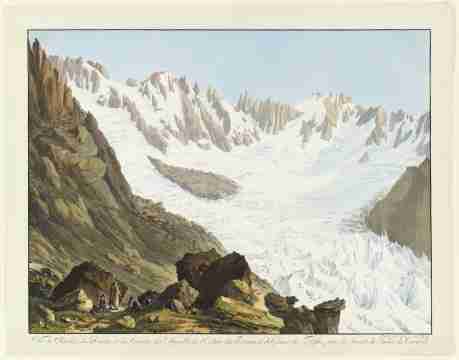 Travellers to the Alps have always been fascinated by glaciers. 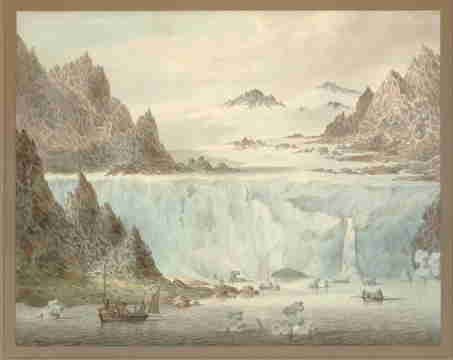 These vast rivers of ice, with their mysterious quality of being both solid and fluid, inspire awe and wonder. 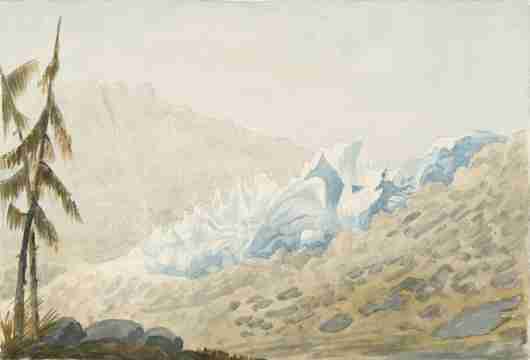 Early watercolour artists, such as the British painters William Pars and John Warwick Smith, stopped to paint glaciers on their journeys through the Alps, making compelling on-the-spot depictions of the dramatic ice-scapes. 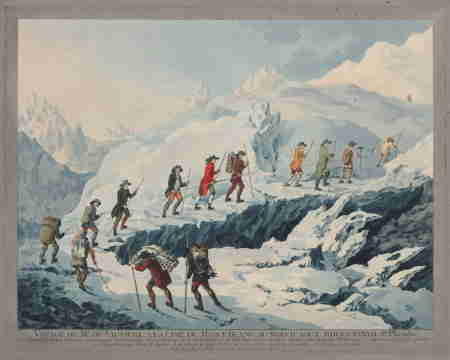 Local people rarely ventured on to glaciers, regarding them as inhospitable places, and dangerous to cross because of deep crevasses and steep ice-falls. 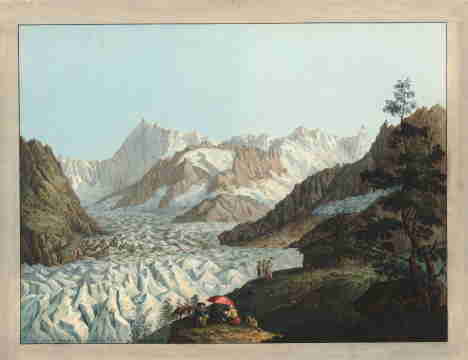 But during the second half of the 18th century, growing interest in science and exploration encouraged more people to visit and investigate glaciers. 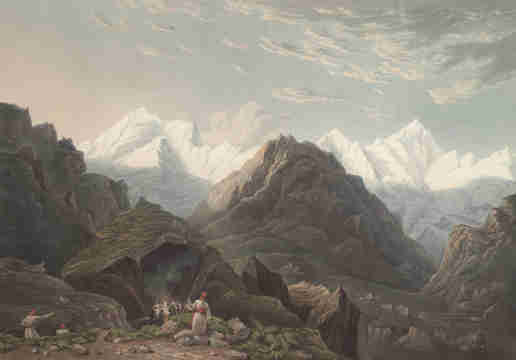 Artists created views of Alpine mountains and glaciers as souvenirs for these travellers, often depicting tourists in the foreground of their pictures. 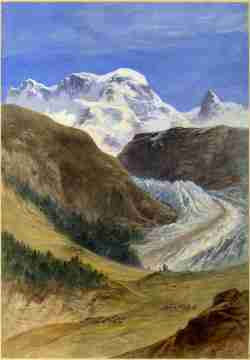 One important figure in the exploration of the Alps was the Swiss scientist and mountaineer, Horace Bénédict de Saussure (1740-1799). 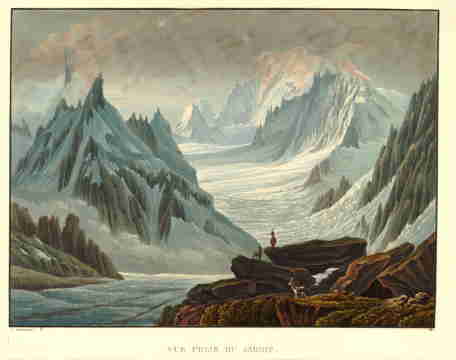 His tours of the Alps between 1767 and 1797 did much to bring this region to greater international attention. 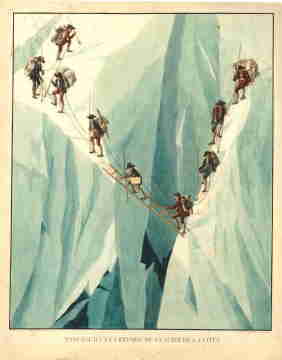 His celebrated ascents of Mont Blanc, the highest peak in western European, were illustrated in coloured prints showing his party’s perilous route through deeply crevassed glaciers. 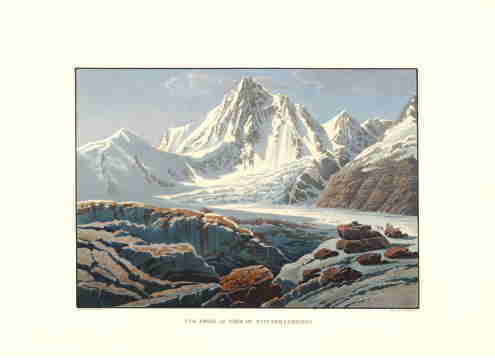 In recent times, glaciers have become obvious indicators of the effects of climate change. 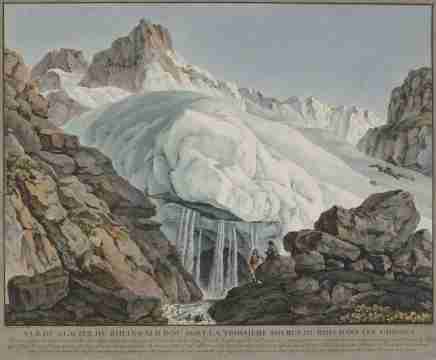 As a result of global warming, glaciers throughout the world are rapidly retreating. 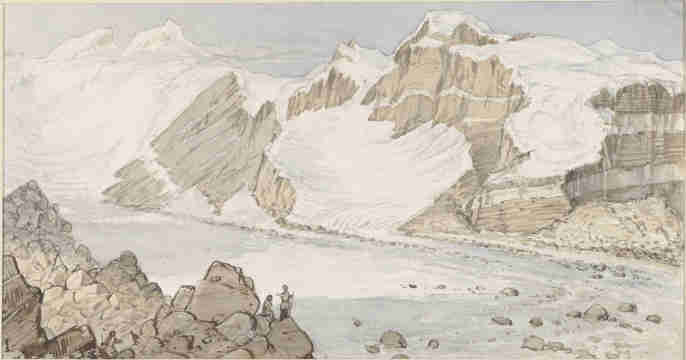 Comparisons of the way they look now with the watercolours made in the 18th and 19th centuries clearly reveal the extent of this loss. 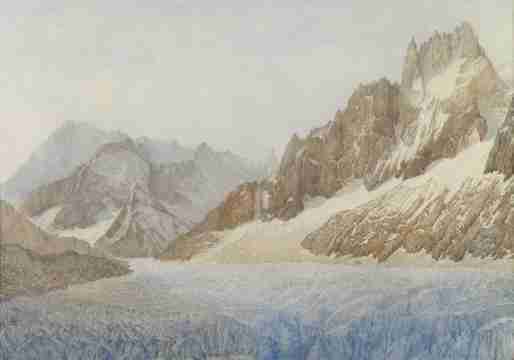 Scientists today are using the valuable record created by watercolour painters in the past as a way of measuring the earlier extent of glaciation in order to better understand the underlying factors for this decline. 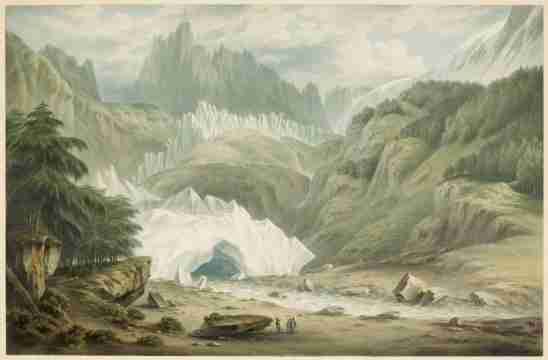 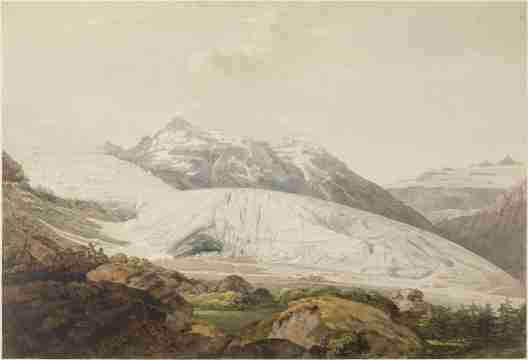 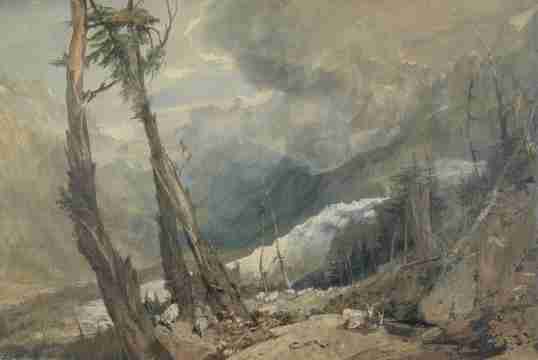 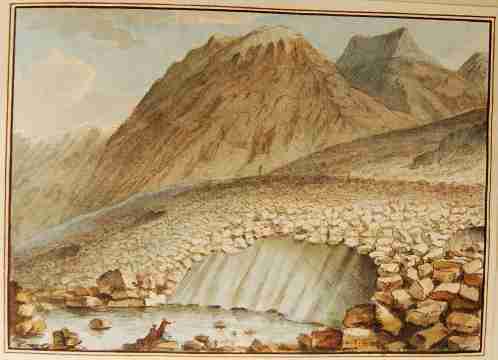 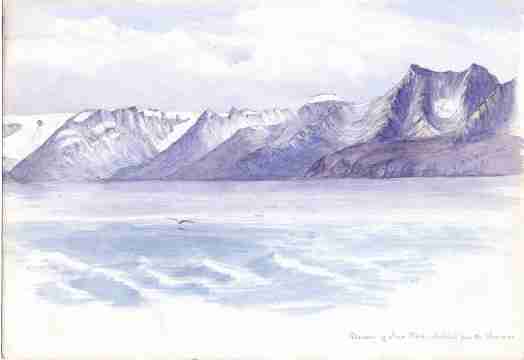 See the most striking watercolours of glaciers in the gallery below or search for related images.